The Dietary Department at The Meadows plans and prepares nutritious appetizing food. The department offers traditional meals such as rappie pie and boiled dinner, as well as other healthy meals based on our four week selective menu. This department works with other departments at The Meadows, to plan special activities such as summer BBQ’s, Christmas and Thanksgiving dinners, Mother’s/Father’s Day teas, etc. where occasions are highlighted by great food. Residents eat, at their leisure, in a dining room located within their house. Meal hours are approximately 7:30 am, 11:30 am and 4:30 pm and residents are supervised by nursing personnel during breakfast, dinner, and supper. Snacks are given between meals and before bedtime and fluids are encouraged and offered throughout the day. The Meadows employs certified Cooks, as well as trained Food Service Workers. The Dietitian will visit residents shortly after they move in to assess their nutritional needs and learn about their likes and dislikes. The Dietitian also plans special diets, helps to manage feeding difficulties and assesses residents for nutritional supplementation and food texture modification. It’s great when family members or friends bring in special foods for their loved one, however, it’s important that safety is the top priority. When you bring in food items please make sure that you clearly mark the food items with the resident’s name, what the food item is, and the date the food was made so staff members know when it is no longer safe for the resident to eat the food item. Please do not bring in potentially unsafe foods such as: unpasteurized dairy products, apple cider, and home-bottled vegetables, meat or fish. Home-bottled jams, jellies, pickles or pickled vegetables are allowed as long as they are labeled properly. All residents are assessed by the Dietitian when they are admitted. Each resident has a diet order that all staff must follow to prevent the resident from choking and experiencing further complications. It is important the food brought in by family members or friends is safe for the resident and allowed as part of their diet order. If you are unsure as to whether or not it is safe, please ask the Dietitian or Nursing staff. 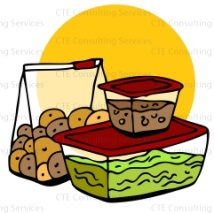 Storage: Foods need to be stored either below 4°C or above 60°C to avoid bacterial growth. foods need to be used as soon as possible.